If you have, then you probably suffer from the Imposter Syndrome – a psychological condition where people attribute their success to luck or timing or some other external factor, and believe they will be exposed as a fraud at some point in time. According to research up to 75% of us feel like that at some point in life. 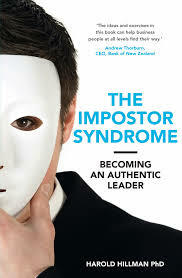 I have just read a fascinating book called The Imposter Syndrome written by New Zealand’s own Harold Hillman. I say New Zealand’s own, but Harold as actually an American who has lived here since 2003. I’m not big on self help or coaching texts, but this one is easy to read and understand and very practical. Hillman says there are two inner voices that speak to you. The first of these is the Critic who despite the name cares about you and puts you first and foremost. The Critic is concerned that you don’t fail. So the Critic focuses on you not failing as opposed to succeeding. The Critic’s major role is to keep you safe from harm. The fewer risks you take the less chance there is of failure. The other key voice is that of the Coach. The Coach loves you too but wants you to stretch yourself, to take risks and be better than you currently are. Hillman brilliantly describes how at the core of the symptoms of Imposter Syndrome is “a sense of insecurity associated with being able to meet the expectations of others….. It is how you size up a challenge relative to your own perceived capability to meet it. There is a tendency to either inflate the challenge, where it becomes bigger than it actually is, or minimize your own capability to take it on.” When this happens your first line of defence is to reach for the imposter’s mask. Sound familiar? Imagine being like that every day not knowing that you have the ability to turn up the volume of the Coach. In HR we deal with Imposter Syndrome sufferers all the time, from the line manager who doesn’t have the confidence to challenge his/her own manager, to the staff member who isn’t sure how he or she is performing and needs reassurance and feedback, and the person who simply doesn’t believe they can deliver a project they have been tasked with. At the root of these “issues” I suspect are people who are simply questioning their ability and allowing the Critic to dominate the inner conversation. So how do we deal with that? One of the last chapters in the book talks about what companies can do about the syndrome. I won’t give the author’s advice away (buy the book) but authentic leadership is at the core of it. We are hearing more and more about the need for leadership that is authentic and real. It’s becoming flavour of the month, the moral high ground of management. But this book is right. If you can stop trying to be something you aren’t and accept that faults and imperfections are a part of you then you are halfway there. So silence that inner Critic, get in touch with your inner Coach and PUMP UP THE VOLUME.